A tiny ball of energy launches from a nearby tree and comes speeding up to my window. Its blurred form resolves as a hovering little bird with a shimmering green body distinctly outlined against the sky and jet black eyes looking nervously around. Its wings beats so incredibly fast there is only grey in the space where they should be. This wee bird – hardly bigger than a large bee – does a quick vertical jump, jabs left and right, and darts away as quickly as it has come. Seconds later I watch it pull up to the top tuft of a tree and rustle its slender body into a waiting position. 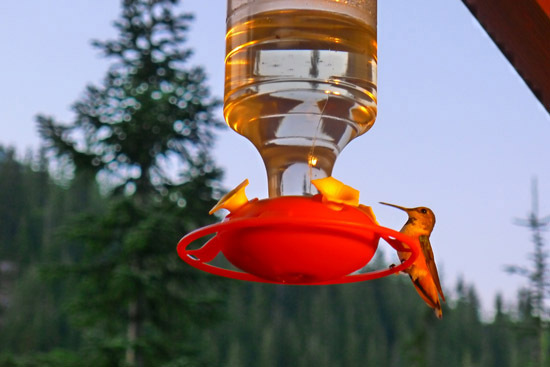 I have the best seat in the cabin for watching the hummingbird wars play out. From my oh-so-seventies swivel chair (in mouse brown) I have a fabulous view of sunlight playing on distant rock slopes strewn with wildflower, berry bushes, and shimmering alder and – closer in – a hundred trees that flood the valley. From the cool recesses among the tops of these alpine firs the hummingbirds emerge, engaging in their serious lightning-fast war to get at the nectar in our two feeders. To catch these miniature birds in an up-close battle, you have to be steely eyed and absolutely still; even the smallest movement will scare them all away. The bird we are this year calling Napoleon Hummingbird stands sentry some 20 feet from the deck. Under the eaves of the roof another hummingbird zips in and he’s on it instantly, chasing it away from the feeder with barely a chatter. At almost the same time, another hummingbird comes up between the rails, flashes his tail feathers above the deck, and nearly makes it to the feeder. A flash and flicker, and that one’s gone too. Now a third and very brazen hummingbird gets all the way to the bar and sticks its long beak into the feeder. With a spectacular divebomb, Napoleon Hummingbird is on the scene, crowding out that feisty bird. Snick snack! The air resonates with the clash of dueling beaks, both birds flashing angrily in a display of tailfeathers. As the other bird beats a hasty retreat, Napoleon Hummingbird regains his post, tiny chest heaving. My rumbling stomach eventually forces me from my perch. 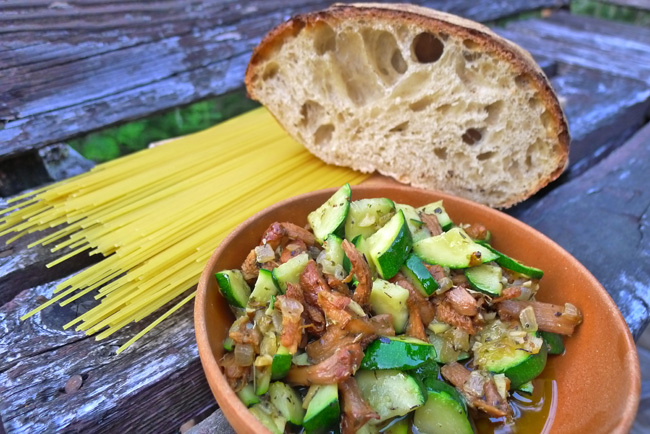 As the shadows grow long, I put together one of our favorite cabin meals: vegetarian spaghetti with chanterelle mushrooms and whatever vegetables Stockings Gardens in Gold Bar has to offer. This week it’s zucchini, fresh from the vine. I slip back into my fug of happiness as Napoleon Hummingbird comes in for his evening feed. Tonight, he rules the roost. But tomorrow? We’ll see. 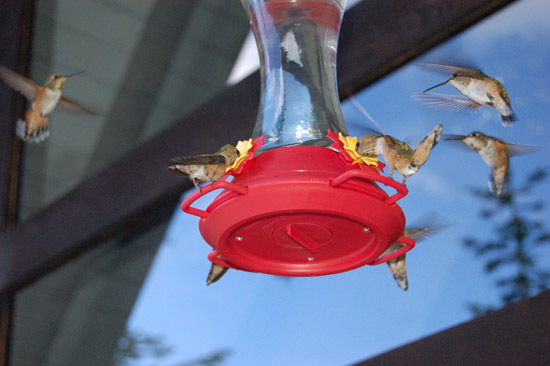 In the lightning fast world of hummingbirds, in the blink of an eye just about everything can change! Bring a large pot of water to the boil. Add the noodles and cook until ‘al dente’, which here at 3600’ elevation means a couple of minute longer than the package directions. Drain and hold the noodles to one side, sprinkling them with a bit of olive oil to keep from sticking together if the veggies aren’t yet finished cooking. Meanwhile, break the chanterelles into bite-sized pieces and sauté them in butter in a 12” frying pan over medium heat. (Alternately use chanterelles frozen from last year’s harvest.) Once the mushrooms are wilted, after about 4 minutes of cooking, remove them and their juices to a bowl or plate. Bring the pan back to temperature over medium high heat and sauté onion in the oil for 4 or 5 minutes until the edges of the onion begin to brown. Add the zucchini and herbs. Cook for 5 more minutes, tossing every minute to evenly heat the zucchini. Now add back the mushrooms and their juices. Add the hot broth and simmer for 3 or 4 more minutes until all the veggies are heated through. Add salt and pepper as desired at the end. Divide the pasta into two bowls or plate and spoon the hot veggies and broth over top. Sprinkle with parmesan as desired. 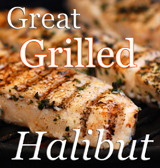 Serve with crusty bread (preferably home or cabin made!) slathered with good butter. And pull up a seat at the window. There are hummingbirds out there, putting on one of nature’s finest shows. Enjoy! Napoleon Hummingbird, king of the feeders for the moment. The scene as it’s played out in other years! 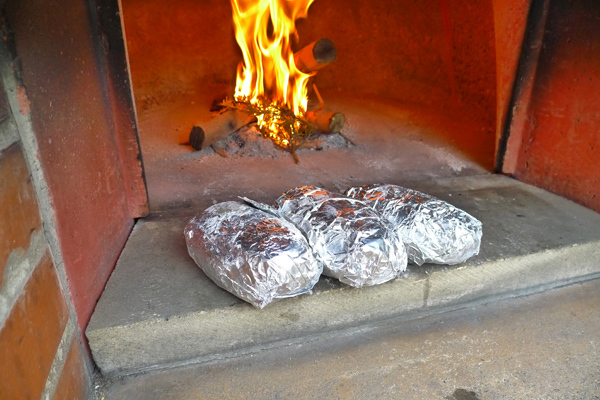 I felt like a Boy Scout on Sunday, roasting potatoes in the dying coals left after an evening of pizza. Wrapped in foil, along with just a hint of butter to keep their skins moist, those potatoes cooked to perfection in a little over an hour. That nutty aroma took me right back to the campfires of my youth. Okay, I’ve gotta tell you: I was a Bad Boy Scout. I was more likely to, say, rock out to Robin Trower with my friends than catch the class for first aid. Or to smoke out beneath the trees when the scout leader wasn’t looking. But I did get into the campfire thing, and lord knows I’ve always loved to cook! Now rather than a dousing of baked beans and a stick-fired hot dog on the side, these most recent potatoes had a different destiny: Potato Bread. 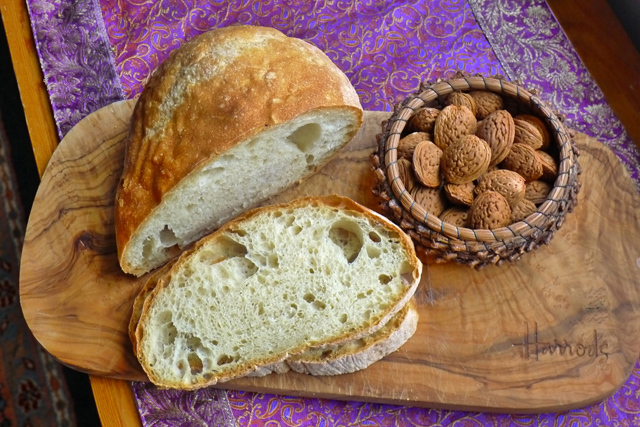 Soft and silky, with a texture like no other bread, this bread is perfect for anything from toast to turkey sandwiches. And as to how to cook the baked potatoes? Sure, any potatoes baked in their skins will work; but for a hot new dimension, you might want to give the Boy Scout method a try. Rock on! Leftover dough note: We always seem to have extra pizza dough on hand at Chez Bullhog, so we either add it to bread or freeze it in 8 ounce portions for later use. Adding day-old dough to bread and pizza dough improves its flavor and texture. If you don’t have day-old dough, add an extra 5 ounces of flour, 3 ounces of water, ½ teaspoon of yeast and ¼ teaspoon salt to the portions above. Make the dough: In a large bowl, mix 8 ounces of leftover pizza dough, 18 ounces (3¾ cups) of bread flour, 2 teaspoons of salt, 1½ teaspoons of dry yeast, 3 Tablespoons of softened butter and 14 ounces (1¾ cups) of water at 100° to make a stiff dough. Once you’ve incorporated all bits, turn the dough ball out onto a lightly floured counter. Knead the dough vigorously for 5 minutes until it’s smooth and stretchy. Clean out the bowl. 1st rise, 2 hours: Return the dough to the bowl, cover with plastic or a damp dish towel and let rise in a warm place (75°) until doubled in size. Slice the potato: Using a mandolin (best) or very sharp knife, slice the baked and cooled potato into pieces the thickness of a dime. Slice skin and all. Add the potato: Once the dough has doubled in bulk, turn it out onto your lightly floured counter and stretch it into a flat oval that’s an inch thick and a foot or so across. 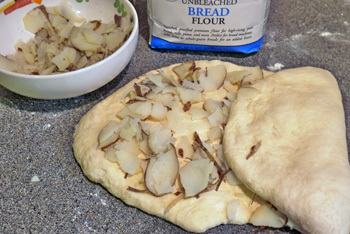 Put a layer of potato slices onto the left 2/3 of the dough. Now fold the other third over and over again to seal the potato bits in. Let rest for 5 minutes and then spread the dough out again and repeat with another layer of potato. Do this until you’ve worked in all the potato. 2nd rise, 1 hour: Return the dough to the bowl, cover and let rise in a warm place for 1 hour. Shaping and final rise: Line 2 bread baskets with cloth napkins sprinkled liberally with flour. Turn the dough out onto the floured counter and cut it into two equal pieces. Shape each piece into a ball and put one ball rounded side down into each of the bread baskets. Let rise for about 45 minutes until puffy. Bake your bread: Line a center rack of your oven with quarry tiles or a pizza stone. Preheat the oven for 30 minutes at 450°. Sprinkle flour onto a wooden peel or the back of a cookie sheet. Flip the risen dough out of the bread baskets and onto the peel or cookie sheet so that the rounded side is up. Slash a design if desired. Slip the loaves directly onto the hot quarry tiles or pizza stone. Bake for 15 minutes at 450°. Lower the oven temperature to 375° and bake for a further 25 to 30 minutes, until the loaves are moderately browned. Let cool for an hour before digging in – that is, if you can wait that long! Making potatoes the Boy Scout way: Scrub baked potatoes and puncture the skins several times with a knife. For each potato, put a thin slice of butter onto the middle of a square of aluminum foil. Set the potato onto the butter, bring the corners of the foil over it and wrap tightly. (Some prefer twisted pigtails on each end for easier grabbing.) Put potatoes butter side down directly into the dying coals of a fire and cover with more coals. Let bake for an hour or more and then fish them out. Yum! Hot potatoes the Boy Scout way. Fresh from the fire and lovely! I’ve been reading Ed Levine’s book, Pizza: A Slice of Heaven. 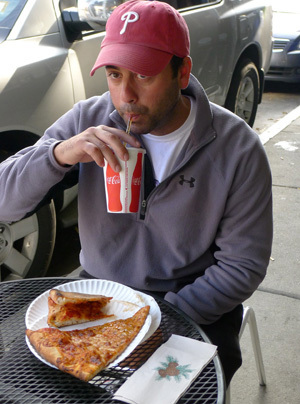 Ed’s a guy who samples on average six pizzas a day and has an opinion about every one, from the dyed-in-the-wool Napolitano to New York’s finest. He’s got the genealogy of pizza in America down to a fine art: from Lombardi’s in 1905, through Totonno’s and Patsy’s to Pepe’s in New Haven, culminating in Pizzeria Bianco in Phoenix, the holy grail of pizza today. Sadly, in Ed’s book, Philadelphia hardly figures. 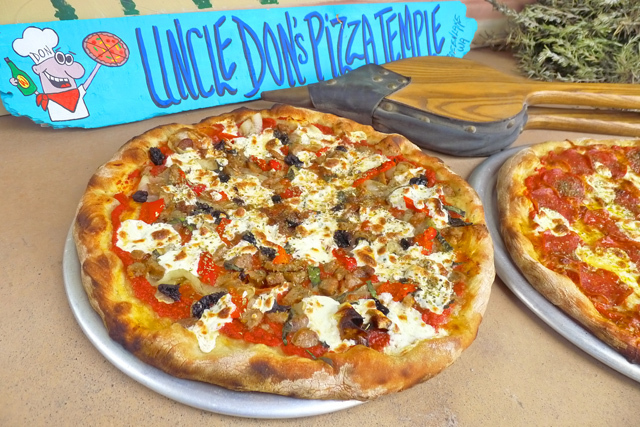 Okay, okay, okay; I’ll admit that Philly isn’t the best of pizza towns. The pizza I remember as a kid was more likely to give pizza burns than satisfaction: flat slabs of what Ed calls ‘boardwalk pizza’, with a thin greasy crust, lots of bad cheese and an oily surface. But I also remember flashes of brilliance when it came to toppings. Put on some locally made sausage, some olives and onions – and maybe red pepper or mushrooms – and you had something delicious to work with. Out here in Seattle, I’m thinking like Chris Bianco, improving on the flavors of my youth. I’ve got the oven fired up with a good head of flame. The base is singeing hot. My favorite dough has been marinating in a little olive oil for 6 hours, and I’ve pureed and strained a can of San Marzanos. A sprinkling of local Isernio sausage, some caramelized onion, oil-cured black olives and fresh mozzarella, and we’re back in the groove; I’m going with roasted red peppers today. Yo! Watch out you guys. Here’s one great Philly pizza coming your way. Get your dough ready: As Ed Levine says – and no doubt Chris Bianco would agree – pizza is all about the crust, so your dough is all-important. Make our dough (click HERE for a printable version) with a 4 ounce piece of day-old dough if you have one, and let it rise for 6 hours at 75° for best results. Punch it down twice when it gets too puffy. Halfway through the process, sprinkle the dough bowl with a Tablespoon of good oil to give the dough Italian flavor. Heat up the oven: We keep ramping up the heat of our oven, in order to give our pizzas a bit of char. If the oven was fired the day before, it can be up to temp in about 2 hours; otherwise we allow 3 hours or more. If we have the time, we’ll start the oven early in the afternoon to allow all of the components to heat up slowly by dinnertime. Make a small fire in the middle of the oven and add increasingly larger sticks of hardwood. Once the fire is roaring, move it around to heat the base. When the ash on the sides and top of your oven has turned white and the base at the front edge is too hot to touch, your oven is ready. Push the fire to the back and sweep the floor. For baking in a conventional oven: At least 30 minutes before baking, put quarry tiles or a pizza stone on a center rack and preheat your oven to the highest temperature setting your oven can handle without engaging the broiler (for my gas oven this is 500°). Make the sauce: We’ve simplified the tomato base here at Chez Bullhog right down to its component parts. Find some canned tomatoes that were grown under the Italian sun (careful – all San Marzanos are not Italian) and crush, puree and strain them. If they’re too watery, add a few tablespoons of tomato paste. That’s all! Prepare the toppings: Cook the sausage and cut it into pieces as desired. Chop half of a sweet onion and cook it in a frying pan until nicely caramelized. Rip a few roasted red peppers into strips. 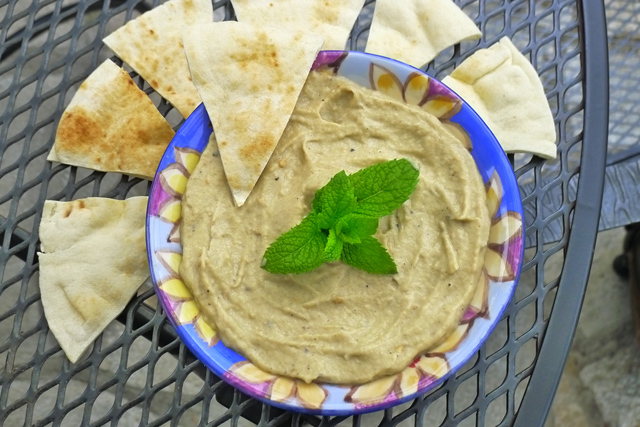 Pit and halve a handful of black olives. Slice 3 or 4 ounces of fresh mozzarella. Have these all handy. Assemble the pizza: Spread 13 ounces of dough into a 12” round. Sprinkle a peel with flour or some cornmeal and put the dough blank onto it. Before continuing, make sure the dough ‘slips’ on the peel. Sprinkle 2 teaspoons of olive oil onto the dough blank and spread 4 ounces of crushed San Marzano tomatoes onto it. Now add 3 shredded basil leaves, the Italian sausage, caramelized onion, red pepper strips, black olives, and fresh mozzarella. Top with a teaspoon of dried oregano. 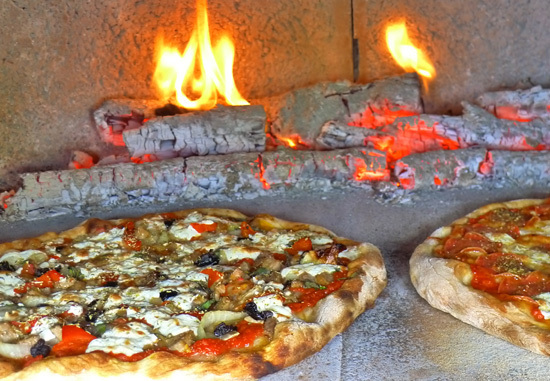 Bake the pizza: Slip the pizza directly onto the base of the woodfired oven or onto the quarry tiles or pizza stone. In a woodfired oven, this pizza will take 4 or 5 minutes, turned 2 or three times to heat evenly. In a conventional oven, it will take more like 8 minutes. The pizza is ready when the crust is nicely browned (with some char marks in the woodfired oven) and the toppings are sizzling. When you bite into it, think of Rocky running up the steps of the Philadelphia Art Museum. But do realize this: for all his Philly background, Sly Stallone never had it so good! 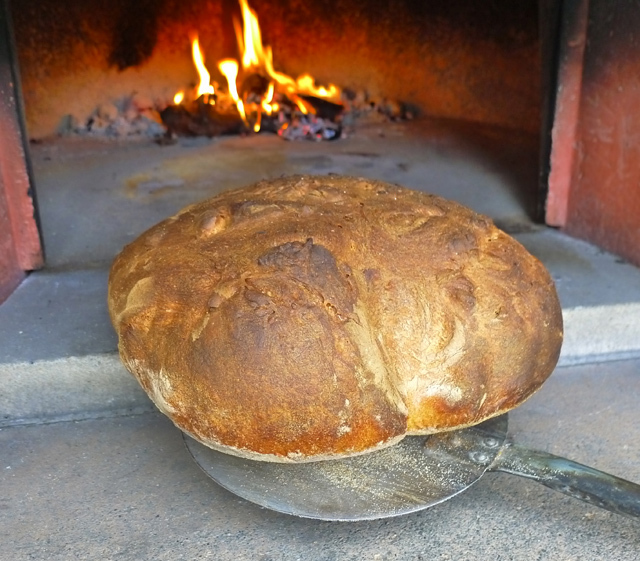 What’s not to love about a big old woodfired loaf of bread? The first time I saw a Pain Poilâne, I wanted to sink my teeth right into its yeasty innards and let the smell of smoke waft into my brain. And that big crusty miche on the cover of Peter Reinhart’s book? Okay, it’s not woodfired, but it’s dark enough to make me drool. Yes, I’ll admit; I’ve got bread love and I’ve got it bad. So when I saw the Pane de Matera on display at the Pike Place Market’s cheese festival last weekend, I fell in love all over again. 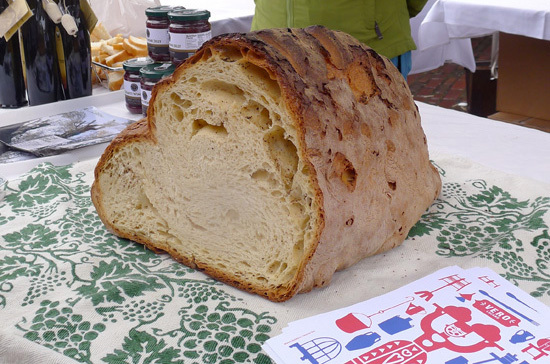 Here was a beautiful, crusty loaf with a creamy center, made by Vero Lucano in brick ovens over in Italy. 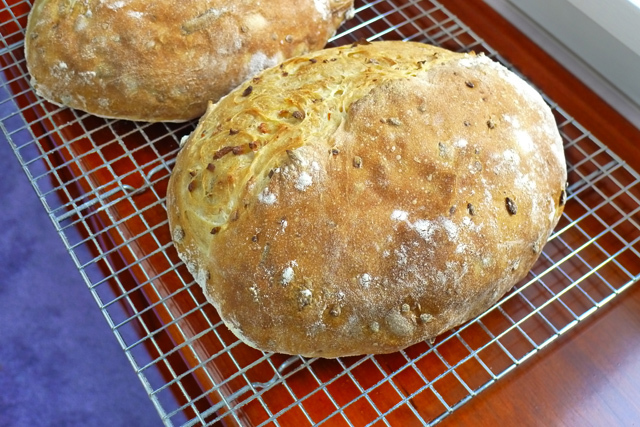 I didn’t get to sample it, but it looked similar to smaller loaves we’ve been making here at Chez Bullhog. I’d have to admit it held the advantage in size – sometimes, bigger really is better! Here’s how I make my own. Make the sponge: Two days before you want to make your bread, combine 2 ounces each of spelt, semolina and rye flours, a cup or so of bread flour, a 4-ounce piece of day-old dough, 10 ounces of cold water and a half teaspoon of dry yeast. Mix thoroughly until your sponge resembles porridge. Cover lightly and let ferment in a cool place for between 24 and 48 hours. Make the dough: Scrape the sponge into a large mixing bowl. Add 4 ounces (5/8 cup) of semolina, 16 ounces (3½ cups) of all-purpose unbleached flour, 8 ounces (1¾ cups) of bread flour, 20 ounces (2½ cups) of water at 100°, 2 teaspoons of salt and 1 teaspoon of dry yeast. Using the handle of a wooden spoon, mix well, scraping down the sides of the bowl as necessary until you have a large ball of dough. Turn out onto a lightly floured counter and knead for 5 minutes or more. 1st rise: Clean out your bread bowl and return the dough to it. Cover lightly with a lid or plastic wrap and let rise for 3 or 4 hours until double in bulk. Air temperature at this phase should be 65 to 70 degrees. 2nd rise: Turn the dough out onto a lightly floured counter and press most of the air out of it. Pull the edges in to the center, turn the dough over. Return it to the bowl, lightly covered, and let rise for a further 2 to 3 hours. Increase the air temperature to 80° for this phase. 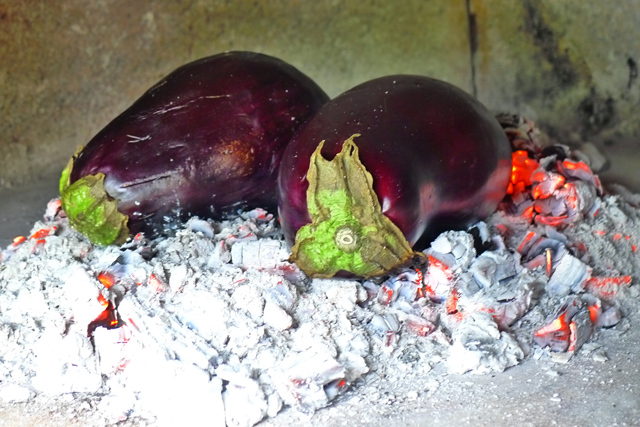 Preheat your woodfired oven: Your fire should be at least 2 hours old, with moderate to high heat. You can keep the fire in the center until the last minute to heat the oven deck where this big guy will sit while baking. Push the mature coals to the back of the oven and brush the ashes off of the floor. 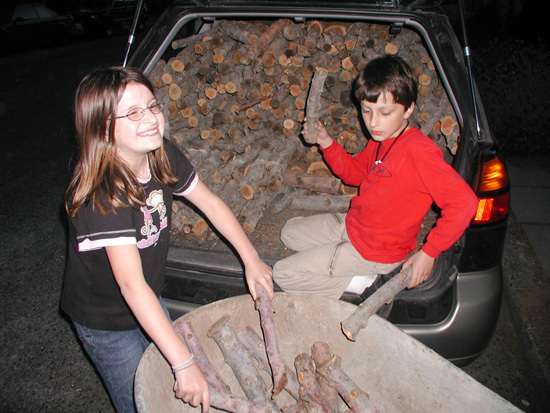 There should be 6 to 8 fist-sized chunks of glowing hardwood coal and a good bed of embers when the bread goes in. A small amount of active flame will give a light char to the crust. Shaping and last proof: After its second rise, turn the dough onto the counter and cut it into three pieces. Shape each piece to look like a fat baguette and braid the pieces, tucking the ends under. 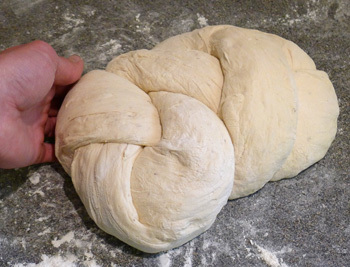 Place the loaf on a wooden peel well-dusted with semolina and let rise at 80° for a further 45 minutes, until the braids are no longer recognizable. Brush lightly with water and slash the top if desired. Bake for 1 hour 10 minutes, until dark brown. Put the cover in place on the front of the oven, leaving it cocked open by 1” on one side. Turn the bread after 20 minutes, and again several times to ensure even baking. Once your Big Fat Italian Bread is baked, allow it to cool for at least 2 hours to fully develop its lovely crust. Better would be to give it longer, but I know I can never wait. Enjoy! Jerry keeps a supply of applewood for me in a makeshift shed tucked away in a stand of tall cottonwoods that’s barely a hundred feet from the Yakima River. To get to it, I negotiate my car around stacks of orchard boxes punctuated by assorted vehicles: an old city bus, a fire truck, two jeeps, some golf carts and a rusty farm tractor spilling engine parts. There’s stuff piled everywhere, the kind of stuff that might come in handy sometime. 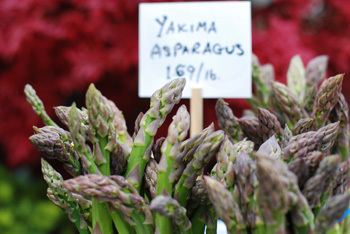 Fresh Yakima asparagus: there's nothing finer! Behind a garage made from cast off building materials, Jerry pulls aside a flimsy piece of sheet metal and guides me into a narrow gap in the chest-high weeds. The wood’s all there, cozy and dry, stacked ceiling high and cascading to the dirt floor from two huge piles. A rough framework holding up the corrugated roof threatens to collapse, but in his can-do way Jerry just props it up with another handy piece of wood. Jerry doesn’t talk a lot, so it took coming here for nigh on six years for me to learn he’s got a son who lives nearby. In all those years, I’ve never met his wife, though I know she’s over there sewing in the big metal-clad house. As sure as a farmer, Jerry tends his five acres. His leathery hands are constantly on the move, shifting bits and pieces with deliberate movements. Every time I show up to load my trusty Subaru, the yard is different. It’s like watching a slow-moving glacier. Jerry looks up from whatever project he’s busy with and comes to greet me the same way every time. “You’ve got bread for me?” I think for him that’s as important as the modest amount of cash that changes hands. A horse tethered under the trees watches as we load the car. Jerry works like a machine, sending wood into the hatch at a steady rate until my sweat mixes with the cottonwood fluff that rises in the Yakima heat. I cry uncle and wipe my brow. Jerry’s face creases almost to a smile and looks at me as if I’m some city born specimen. Later, I catch my breath in the parking lot of the big fruit stand just off of I-90, gloating over my haul. I check the springs on the Subaru to make sure I haven’t overloaded it, and then duck in for my second payload: Yakima Asparagus. Big spears, roughly cut. Fresh and full of flavor, they’re absolutely the best. I go back over the mountains to Seattle humming a happy tune. Make the pie shell: Preheat oven to 350°. Combine flour and salt in a mixing bowl. Using a pastry cutter or 2 table knives, cut the butter and shortening into the flour until the bits are the size of small peas. Quickly squeeze the bits with your fingers so that the fat is incorporated with the flour and then add enough cold water to make a stiff dough. Roll the dough out on a lightly floured counter to make a 12” round. Fold the pastry into quarters and unfold it into a 9” pie plate. Crimp the edges to form an even crust. Prick the pie shell all over with a fork and prebake it for 12-15 minutes in the oven until lightly brown. Prepare the veggies: Wash the asparagus to remove grit. Trim the top 6” from the stalks (discard the hard bottom pieces) and steam them for 5 minutes until barely wilted. Chop the asparagus into ½” pieces, reserving some of the spear tips to decorate the top of the quiche. Sauté the onion and mushrooms in oil or butter over medium heat for 5 minutes until the mushrooms are lightly browned and the onion is translucent. Let cool slightly. Assemble and bake the quiche: Break the whole eggs into a bowl and add the egg whites. Whisk until whites and yolks are thoroughly combined. Gradually whisk in the milk, a little at a time. Add a pinch of nutmeg and salt and pepper to taste. Put all of the veggies except the reserved spear tips into the pie shell. Add the grated cheese. Pour the egg mixture over the top and – very gently – stir the veggies and cheese to suspend them in the egg. Push the reserved spear tips into the surface. 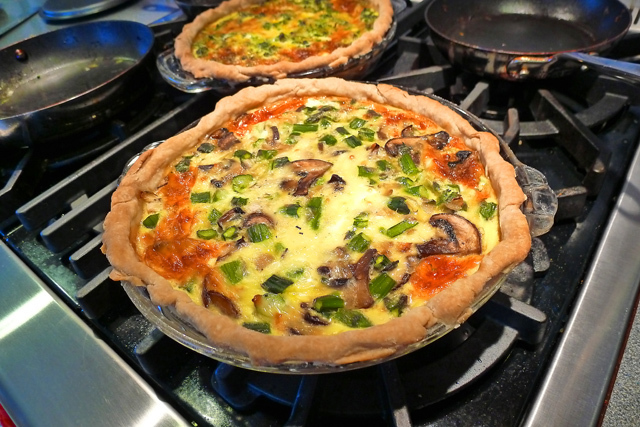 Bake the quiche for 35-40 minutes at 350° until crust is browned and the egg at the center is barely set. Let quiche cool for 20 minutes before serving. “Sinpannay; conpannay.” A man holding a white pad stood by our weatherbeaten outdoor table, gesturing from me to the Salad Queen. His face was turning red. We were so frazzed by our drive that we just didn’t get it. “Sinpannay. Conpannay.” He gestured back and forth, threw up his arms and stalked off. His thin cry of exasperation drifted out from the kitchen. Our children, who were very young at the time, raced around in the green grass nearby. The mist from the mountains lent a cool counterpoint to the sun that had been frying us in the lowlands all morning. We were all relieved to be out of the car and here in the lush hills above Lucca, no doubt at exactly the time this wayside restaurant was about to close for the afternoon. “Sinpannay; conpannay,” the man said under his breath some minutes later as he plonked two steaming bowls onto our table. He gave us a last look and backed quickly away as if whatever we had was catching. 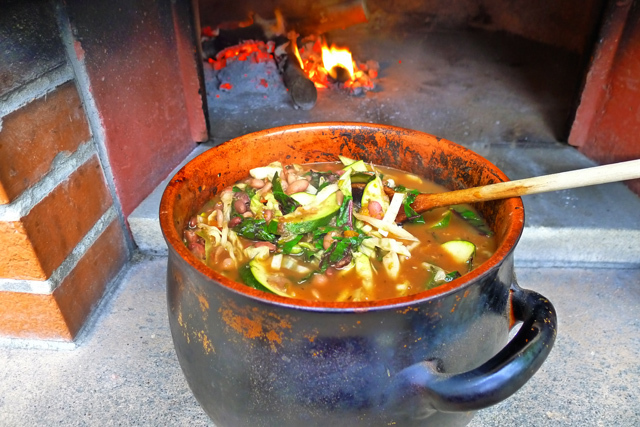 Both bowls gushed with vegetables – cabbage, chard, onion and zucchini – all swimming in a luscious broth. We dug in hungrily before we understood: we’d ordered exactly the same soup, one without and one with bread in the bottom of the bowl. ‘Sin pane’ and ‘con pane.’ We looked at each other and burst out laughing. Here’s the Chez Bullhog version of the same. Woodfired Oven note: This soup is slow-cooked in the falling heat of an oven that has already been hot. At Chez Bullhog we make it the day after baking bread or pizza. Restart your oven with a few small (1½” inch) sticks of hardwood and put the bean pot, Dutch oven or casserole off to one side of the fire. A small fire every hour or so is all it takes to keep the soup happy. 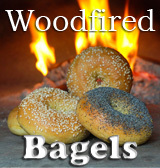 See Moderating Fire in a Woodfired Oven for more on this. 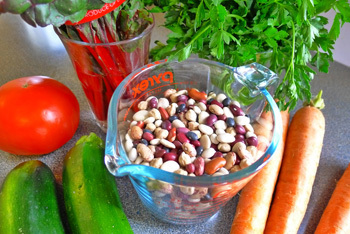 Cook the beans: Put 1 pound of mixed beans (or the beans from a 16-bean soup packet) into an Italian bean pot, Dutch oven or large fireproof casserole with a tight-fitting lid. Add 6 cups of cold water, half of a large onion split into two pieces, 4 cloves of crushed and chopped garlic and a heaping teaspoon of dried oregano. Build a fire to one side of your oven with a handful of kindling, 3 skinny sticks and 3 hardwood sticks that are 1½” thick. Put the covered bean pot on the other side. Let the fire burn for an hour or more until the fire is down to active coals. Make a second fire on top of the first and turn the bean pot around. After 1 hour, the bean pot should be warm to the touch, after 2 hours it should be too hot to touch and after 3 hours the beans should be steaming. 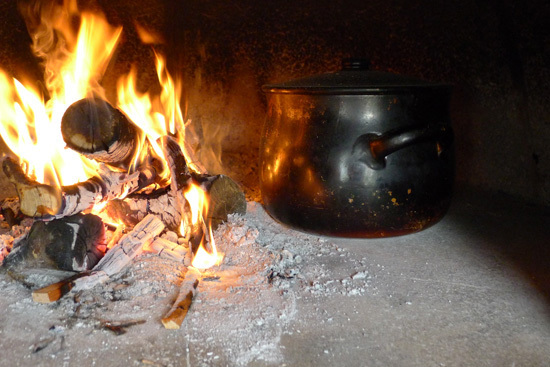 If after three hours the pot is not steaming, make a slightly larger fire and put in a medium-sized log. Otherwise, continue making small fires. Add the seasonings: Heat 4 Tablespoon of olive oil in a large frying pan over medium heat. Add half of a large onion coarsely chopped, 3 cloves of minced garlic, 2 coarsely chopped carrots, 3 sprigs of finely chopped Rosemary, a handful of chopped Italian parsley and a small handful of chopped fresh thyme. Sauté 10 minutes until onion and carrots are wilted but not browned. Now stir in a bay leaf, a large chopped tomato, and 6 ounces of tomato sauce. Turn the heat down when the sauce is bubbly and simmer for 10 minutes. Add this sauce to the beans. 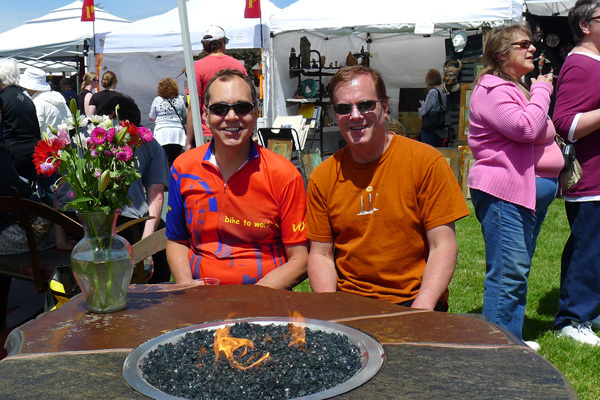 Make a medium-sized fire and continue cooking until the beans are tender – one to two more hours, depending on the level of heat and the age of the beans. Add the vegetables: Finally add 2 chopped zucchini, 2 cups of shredded cabbage, and 2 cups of swiss chard, stripped from the stems and chopped. Add 2 teaspoons of salt and 2 cups of hot water, or enough to not quite cover the vegetables. Simmer the soup for a further 30 minutes until the veggies are cooked through. Serve the soup with a bit of parmesan cheese sprinkled over it, if desired. Or – if you really want to, you can put some bread in the bottom of the bowl and pour the soup over it. Here at Chez Bullhog, however, we prefer to serve a big crusty loaf on the side! Before grunge or Starbucks ever took hold in Seattle, the Salad Queen cooked me an Indian curry. Back then there were no Indian restaurants to speak of, so during dinner she regaled me with stories of fabulous feasts she’d had as a girl growing up in England. Quite frankly, I didn’t understand a tenth of what she was describing. Later at a restaurant in Victoria, BC, I got the full treatment. Dark, soft-spoken men in Sarwal Kameez hovered by our table. Massive fern fronds dipped in the autumn breeze; sitar music wafted in the fragrant air. My eyes got wide when our waiter put before us an assortment of goodies: samosas, pakoras, and sauces for dipping. I don’t remember the main course, but I do remember it came on a plate that had spaces around the rim for all kinds of nibbles – peanuts and savory herbs and dabs of mango chutney and mint; yogurt with cucumber and dried currants and the first tamarind I ever tasted. My senses, which until then had been slumbering in a sort of suburban purgatory, came alive that day. I’ve had many decent Indian meals since, in London, Manchester, Vancouver and even here in Seattle, where the Indian scene is (finally!) alive and kicking. While most restaurants are not so formal or exotic as that one in Victoria, they all have in common dishes made with freshly ground spices with flavors to wake up even the sleepiest of palates. 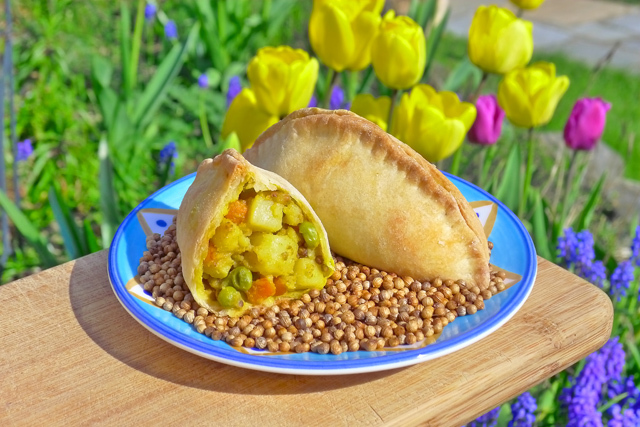 And we always order vegetable samosas – pastries filled with potato, carrot, peas and spices – to begin the meal. It wouldn’t be a real Indian feast otherwise! Here’s my take on them. Make the pastry dough: In a large bowl, mix 2 cups of flour and ¾ teaspoon of salt. Using 2 knives or a pastry cutter, cut in 3 Tablespoons of butter until the pieces are smaller than a pea. Add 3 heaping Tablespoons of plain Greek yogurt and lightly mix to incorporate. Now add enough cold water to make a stiff dough. Depending on the consistency of the yogurt, this amount will be between 6 and 8 Tablespoons. Knead the dough in the bowl until it is soft and smooth; cover with plastic wrap and let rest while you make the filling. Wrapped tightly, the dough will keep up to 24 hours in the fridge. Make the filling: Meanwhile, boil 4 or 5 medium-sized red potatoes until their skins crack, about 22 minutes. Slip them out of their skins as best you can and cut the potatoes into ½” dice. Peel and finely chop half of a medium-sized onion. Top and tail 8 ounces of carrot and chop into ½” dice. Have 1 cup of frozen peas available. Grind 2 Tablespoons of coriander seed with a mortar and pestle or in a small grinder. Heat 3 Tablespoons of butter in a large frying pan over medium heat until melted. Add the ground coriander seeds and brown for 30 seconds until they sizzle. Add the onion and carrot and sauté them, stirring and flipping every so often, for 4 or 5 minutes until the onion is soft. Add the turmeric, curry powder and salt and cook for another minute. Add the potato and cook the whole mixture for a few minutes more to incorporate the spices. Add 1 cup of frozen peas right at the end; stir them in and remove the pan from the heat. Heat a small frying pan over medium-high heat. When hot, add 1 teaspoon of butter and, as it begins to sizzle, add a teaspoon each of whole coriander seed and yellow mustard seed. Fry for 20 seconds or so until the seeds begin to pop. Do not overcook or the seeds will take on a burnt flavor. Immediately stir these crispy seeds into the potato mixture. 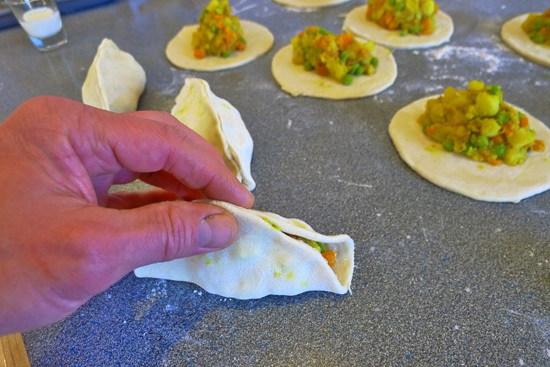 Assemble the samosas: On a lightly floured work surface, roll out the dough with a rolling pin until the dough is 1/8” thick. Using those ubiquitous plastic lids from cheese, yogurt or deli tubs, stamp out 4½” rounds of pastry. Re-roll and re-stamp any scraps until you have at least 10 rounds of pastry. Put 2 or 3 heaping spoons of the filling onto the middle of each round. Brush the edges of the pastry with a little water or milk to strengthen the seal. 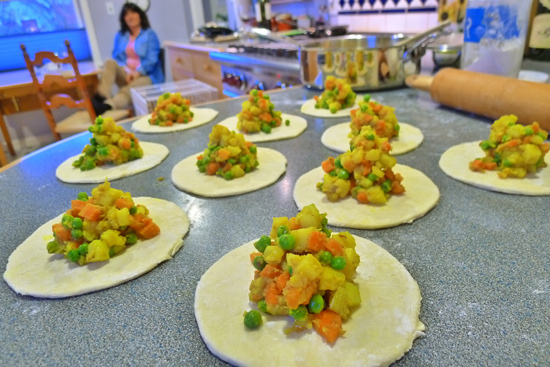 On each samosa, bring the sides of the pastry up and over the filling to meet at the top. Gently squeeze the pastry to stick the edges together at the crest and then squeeze your way down each side. 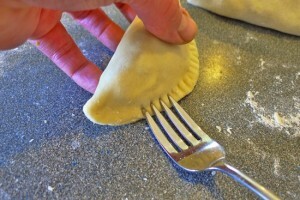 Now turn the samosa on its side and, using a fork, seal the edge. Turn the samosa over and do the other side, just to be sure. Bake the samosas: Preheat your oven to 375°. Put the samosas edge up on a lightly grease cookie sheet and bake for 25 minute until lightly browned. Let cool on a rack for 20 minutes and enjoy! Note: These savory snacks also freeze well. To reheat, bake frozen samosas at 350° for 20 minutes. Lay a small piece of foil loosely over each samosa to keep from overbrowning, if desired. Samosas being assembled on the counter as the Salad Queen looks on. I would love to fire up the woodfired oven every day. But somehow – whether it’s a house project that requires my attention, Dad doing taxi duty, or a sudden downpour that puts me off – the rest of life has an uncanny habit of getting in the way. So more often than I care to admit, here at Chez Bullhog we turn to the indoor oven to produce our daily bread. With a modicum of planning, this bread does an excellent job of meeting our (somewhat discerning) needs. It has a well- developed crust, a crumb that’s stretchy and nicely hydrated and a flavor that is at once bright and mildly yeasty. The only complaint I ever get from my kids is that sometimes the holes under the crust get too big. I can live with that. Besides the fact that every loaf turns out big and puffy and perfect, the coolest thing from a baker’s perspective is that it’s a great proving ground for the variety of flours available on your grocer’s shelf. I’ve done this recipe with all kinds of white flours, from our local Shepherd’s Grain augmented with Hi Gluten flour to a mix of Gold Medal and Italian Caputo. Last night’s loaves, made with Bob’s Red Mill Organic White Flour, had my family swooning! Make the sponge: A day before you will be baking the loaves whisk together 1 cup (5 ounces) of all-purpose flour, ½ teaspoon of dry yeast and ¼ teaspoon of salt in a quart-sized bowl. With the handle of a wooden spoon, stir in ¾ cups of cold water until smooth (about 100 strokes). Cover lightly with plastic and let stand in a cool place for 16 to 24 hours. Make the dough: Next morning, in a large bread bowl combine 4¼ cups (20 ounces) of all-purpose or bread flour, ½ teaspoon of dry yeast, 1½ teaspoons of salt, and 2 cups (17 ounces by weight) of water at 100°. Add all of the mature sponge mixture. 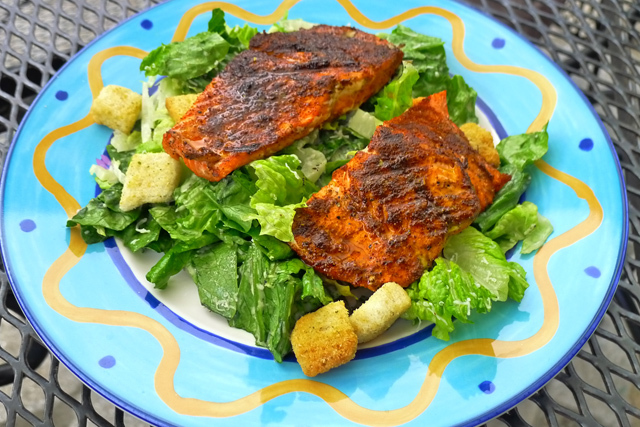 Mix well with the handle of a wooden spoon, scraping the sides of the bowl as necessary. Sprinkle a work surface liberally with flour and turn the dough out onto it. Invert the bowl on top of the dough and let it rest for 30 minutes. After 30 minutes, knead vigorously for 5 minutes until the dough is smooth and stretchy. First rise: Put the dough back into the bowl, cover with plastic or a damp cloth and let rise at room temperature for 3 hours, until doubled in size. Second rise: Punch down the dough; knead lightly on a floured surface and tuck to reform the ball. 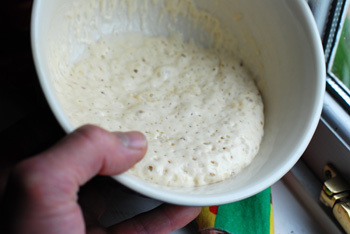 Put the dough back into the bowl, cover and let rise a further 2½ hours at room temperature. Shape the loves: Rub some flour into the center of 2 cloth napkins and line 9-inch round baskets with them. Sprinkle a teaspoon of fine cornmeal onto each floured cloth. Turn the dough out onto your floured counter and divide into two equal pieces. Push most of the air out of each piece of dough; fold edges into the center to create a ball. Put the balls fold-side down into the floured baskets. Let rise 1 hour at room temperature. Bake the loaves: Place a pizza stone or 6 quarry tiles onto an oven rack and set the rack 1 notch below the halfway point in your oven. Preheat the oven to 450° for a minimum of 25 minutes. Sprinkle more flour and cornmeal onto a wooden peel or the back of a cookie sheet. Turn each risen loaf of dough onto your hand and then plop it fold-side down onto the cornmeal. Tuck the sides under to elongate the loaves, but don’t push out any air. 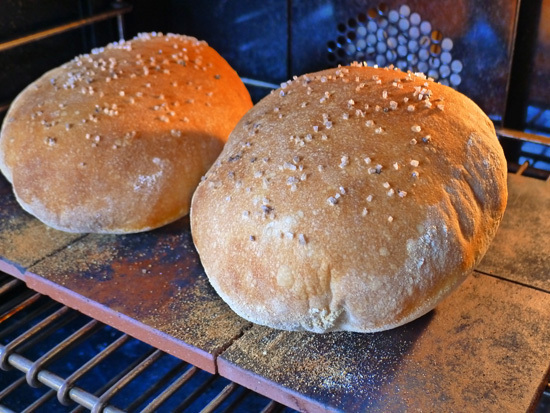 Pat or brush loaves 3 times with a small amount of water and sprinkle them with salt. Slip the loaves into the oven directly onto the preheated quarry tiles. Bake for 15 minutes at 450°. Lower the temperature to 350° and bake for a further 45 minutes until loaves are puffy and brown. Let cool for 30 minutes before digging in!